Whenever I make pasta, I take the throw-everything-in approach. This means I start with green peppers and mushrooms, then proceed to chop up and use the rest of the random veggies in my crisper. I had some kale in there yesterday, but it didn't get used. I still haven't convinced Jason of its deliciousness. Regardless, the pasta was good. And full of veggies (and ground turkey). But that's not where I started my day. That was the end of it, actually. I started my day much earlier with breakfast. It was (of course) a huge bowl of overnight oats that I ended up microwaving at 5:00AM when I got up to pump. Love me some oats topped with strawberries and kiwi...and some Archer Farms Almond, Peanut & Cashew Butter. My second breakfast came a bit later, and was really just a snack. 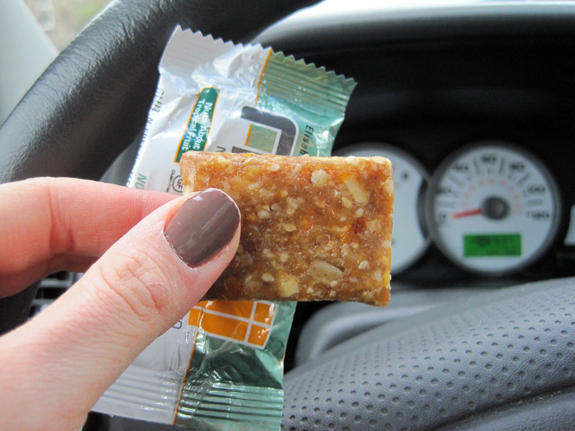 We got some free samples of Elizabeth Hasselbeck's NoGii bars at the gym the other day. I popped one on my way to work. Gotta say, not a huge fan of Elizabeth but I do like her bars. Flavor: Nuts About Tropical Fruit. And I guess it's Paleo if that's your thing. I don't know much about the diet myself, but if I were on the diet, I'd probably be glad that these could be involved. My favorite salad, with a side of Chobani and a rice cake topped with some NuttZo. Seriously good, all of it. Not pictured: The small handful of Cadbury Mini Eggs that I ate for dessert. Hey, at least they were the dark chocolate version. And at least I'm being honest. I don't think I'll ever get sick of apples and peanut butter. Oddly enough, this organic Gala was the cheapest one of the bunch. Cheap organic produce? Count me in. And that's What I Ate Wednesday. Well...what I ate on Tuesday, actually. Question: Eat anything delish today? I need you to do my grocery shopping. That's half the battle. A personal shopper for groceries...I think you're on to something. If it works for clothes, it could work for food.